Habit: Annual, perennial herb, [shrub, tree], glabrous or occasionally hairy, sometimes glandular, resin canals sometimes obvious as dark dots or streaks on stems, leaves, flowers, or fruits. Leaf: cauline, simple, alternate, opposite, subopposite, or whorled; stipules 0; petioled or not. Inflorescence: axillary, raceme, [panicle, umbel] or flowers 1 [or in whorls]. Flower: bisexual, radial; parts in 4s to 9s; calyx deeply lobed, generally green (petal-like); corolla (0) or lobes generally spreading; stamens epipetalous (or not if corolla 0), opposite corolla lobes, filaments united (or free) just distal to point of attachment to corolla, staminodes 0 [present]; ovary superior, 1-chambered, placenta free-central, style 1, stigma generally head-like. Fruit: capsule, circumscissile or 5--6-valved [drupe, drupe-like]. Seed: --many. Genera In Family: +- 35 genera, 800 species: especially tropics, subtropics; some ornamental. Note: Based on molecular evidence, non-rosette terrestrial members of Primulaceae as treated in TJM (1993) removed to Myrsinaceae. Based on phylogenetic research, all California members of Myrsinaceae have been transferred to Lysimachia (Manns & Anderberg 2009 Willdenowia 39:49--54 and Cholewa 2014 Phytoneuron 2014-28: 1--2), as reflected in this revised treatment. Unabridged Note: Recent molecular work has redefined Ericales. Non-rosette, terrestrial members of Primulaceae s.l. are now widely treated in Myrsinoideae or Myrsinaceae, which are further characterized by synapomorphies of dark dots or streaks on stems, leaves, or flowers, short corolla tubes, seeds immersed in the placenta, and -- for woody members -- wood lacking rays or with only multiseriate rays. Primulaceae, Myrsinaceae, Theophrastaceae, and Maesaceae (a recent segregate of tropical trees) constitute a closely related, monophyletic group. Lysimachia has been recognized (even by Linnaeus) as a rather complex group with close affinities to other genera (Glaux, for instance, has been shown to be an apetalous sp. of Lysimachia). Phylogenetic research (by Arne A. Anderberg and colleagues in Europe) on this and related genera indicated that they were actually specialized taxa that had evolved within Lysimachia, so that all California members of Myrsinaceae now have been transferred to Lysimachia (Manns & Anderberg 2009 Willdenowia 39:49--54 and Cholewa 2014 Phytoneuron 2014-28: 1--2), as reflected in this revised treatment that now includes Lysimachia arvensis, Lysimachia europaea, Lysimachia latifolia, Lysimachia maritima, Lysimachia minima, and Lysimachia monelli, in addition to the two species previously treated in the genus. Habit: Glabrous, glandular, or hairy. Leaf: linear, lanceolate or elliptic to widely ovate, generally entire. Flower: parts in 4s to 9s, generally in 5s to 7s; corolla present or not; filaments free or fused at base. Fruit: 5--6-valved or circumscissile, +- spheric or +- ovoid. Habit: Perennial herb; resin canals obvious. Stem: erect, 30--80 cm, unbranched, glabrous or distally hairy. Leaf: opposite, subopposite, or whorled, often smaller and early deciduous proximally on stem; blade 5--12 cm, lanceolate or elliptic; petiole 0 or present. Inflorescence: flowers in tight racemes in leaf axils, peduncles << subtending leaves. Flower: calyx lobes 5--7(--9), 1--4 mm; corolla yellow, lobes 5--7(--9), 3--5 mm, linear; stamens 5--7(--9), filaments free or united proximally. Fruit: 5--6-valved, >= calyx, +- ovoid. Chromosomes: 2n=40,54. 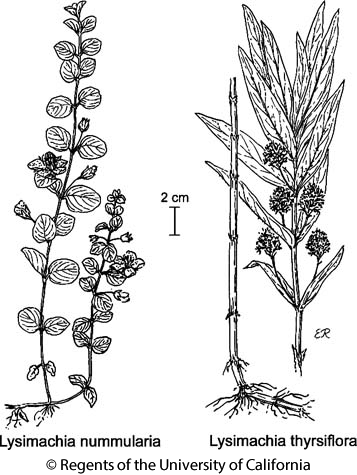 Citation for this treatment: Anita F. Cholewa 2014, Lysimachia thyrsiflora, in Jepson Flora Project (eds.) Jepson eFlora, Revision 2, http://ucjeps.berkeley.edu/eflora/eflora_display.php?tid=32389, accessed on April 20, 2019. KR, CaR, n SNF (Calaveras Co.), n SNH (Plumas Co.), MP; Markers link to CCH specimen records. Yellow markers indicate records that may provide evidence for eFlora range revision or may have georeferencing or identification issues. Purple markers indicate specimens collected from a garden, greenhouse, or other non-wild location.